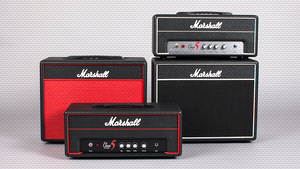 KitMonsters – Marshall Special Edition Class 5 Roulette. The music makers’ guide to making music. Marshall’s Special Edition Class 5 Roulette is aimed at those who want authentic all-valve tone at lower volume, and has a ‘low power, big tone’ design. Built exclusively for the UK market, it is a British made, single channel amplifier available as a compact combo, or a ‘small box’ head with a compact 1 x 10” speaker cabinet. The head and cab are sold as a matched pair. With an all-valve signal path, the non master volume C5 Roulette has true class A circuitry, producing 5 Watts of pure, vintage Marshall tone that responds naturally to playing dynamics. It has a simple ‘Plexi-esque’ front panel with Bass, Middle & Treble tone stack, and the combo features Low Power Mode with filtered headphone output.